AFK (2007) by Huckleberry Hax – What the Huck? I look back and wonder when it all went wrong. I wonder when magical turned into mundane, when novelty turned into necessity. I wonder when it was that SL stopped being something I chose to do and became something I needed. 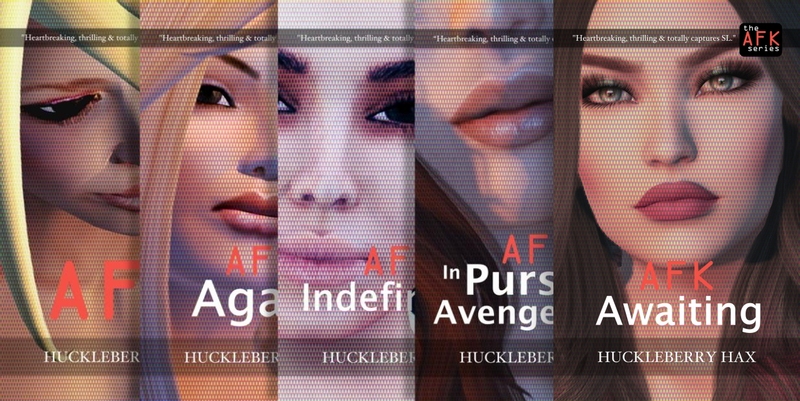 And now also read the sequels: AFK, Again, AFK, Indefinitely and AFK, in Pursuit of Avengement. This book is free in all electronic formats. Amazon Kindle: Due to the way that Amazon operates in different countries, it’s best if you obtain your copy of AFK from your ‘local’ Amazon website. Also, please note that the Kindle version of AFK displays as having a cost (it’s not possible to list as free permanently at Amazon); due to Amazon’s price matching policy, however, the presence of AFK as a free download on other sites should mean you will not be charged. If in doubt, download the Kindle version from Smashwords. Independent authors don’t have large advertising budgets; feedback and ratings, therefore, are the most effective way to show that their work is being purchased and enjoyed. If you have enjoyed this novel, please consider leaving a rating or review at Amazon or whichever other service you obtained it from. It will take you five minutes and cost you nothing, but will help me enormously. Thank you :). Next Proof print version of AFK arrives! Nice job Mr Hax. I thoroughly enjoyed AFK … it certainly resonates with this SL addict. However, my paranoia has increased significantly since finishing your novel … lol. Sorry, that is not allowed, is it? Thanks so much for this feedback. I’m so pleased that people are recommending AFK :) Would it be ok to pass on the link to this web page rather than too the PDF? That way people get to see the page, where they can leave comments if they want to.Huck. You’re brilliant. Please consider pulling this off of free download and finding an agent. 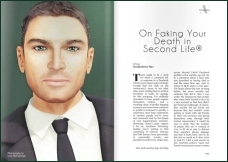 Although your novel resonates particularly with Secondlife players, I think you’ll find that your story -and god what a story it is- stands firm on its own as a surrealistic tale that translates into futuristic for non-players. This is fully as good – and certainly more lively and engaging – than the last Willian Gibson novel I read. Congratulations. I’m sure that you haven’t been following me around, but so many of the conversations that play out in your novel are eerily similar to conversations I’ve had in SL…I laughed through most of the book. I’m handing out the blog link to everyone I know. Great job! Hey, I wrote a SL novel during NaNoWrimo too, kind of. Yours was terrific, really captures what interactions are like. (Can I really make one of those watches?!? )I put a link to your book from my profile, hope that’s okay! Had your url passed to me from an SL friend…and I have to say that AFK is a smooth and enjoyable read that kept me interested to the end… which I had to read twice! Great job! We met once, in a SL Star Trek sim. You made an impression on me, although it took some time for me to realize that. Fantastic work. You encapsulated much of of SL's “oddity” in this piece; the strange, almost other-worldly sense of empowerment, paranoia and godlike enrichment. That Gibson-esque mix of fear and power, knowing that that you are aways dealing with real people, yet can only see a tiny part of their true nature. And them of yours. They will know better whom they are, by works such as yours, that tell where we have already been. Too many times while reading “AFK” I looked over my shoulder, wondering if you had been somehow watching me the past few years. Please, let your muse free and give us more. Drop me a line, Mr. Hax. I'd love to to chat. I'm so thrilled people are continuing to read, enjoy and give such wonderful feedback on AFK. Keep your comments coming! I thought AFK was a fantastic novel – I couldn't “put it down” lol. So many things resonated with me, and it was great to read debates on issues I had discussed with friends inworld and find many of the same thoughts and ideas coming up in the novel. My only “constructive criticism” is that although I thought the twist at the end was great, and didn't see it coming, I felt that the actions of the protagonist right at the end of the novel were out of character with the rest of the novel. Up to that point, I identified with him completely. Otherwise an amazing read, and still relevant to SL today, several years on.